Understanding art as a talisman, a device that possess transformative energy, that is a vehicle for change, Shonibare has collated a heterogeneous survey of works by African artists, its Diaspora and of other backgrounds but who do not necessarily conform to a western vision of art and are sensitive towards African or Black matters. Raquel Villar-Pérez on the group show Talisman in the Age of Difference curated by Yinka Shonibare. Every time more and more the art world is attending to the dissolution of clear roles. The artist’s identity, in the endless fervent search of new languages, becomes fluid and the masterly process of exhibition making becomes a new medium for them to experiment and create their discourses and narratives. 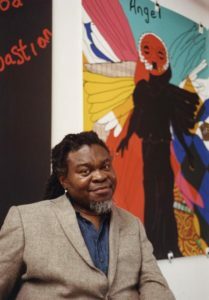 This has been the case of the highly acclaimed British-Nigerian artist Yinka Shonibare MBE. 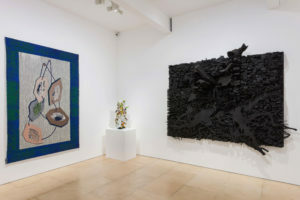 After successfully curating the Gallery VI of Summer Show at the Royal Academy of Arts in London, Shonibare has teamed up with his gallerist Stephen Friedman to present ‘The Talisman in the Age of Difference’ running up until July 21st. Talisman in the Age of Difference, exhibition view. ‘Courtesy of Stephen Friedman Gallery, London’. Shonibare’s work is characterised by the use of brightly coloured African batik fabrics to explore issues of race and class. 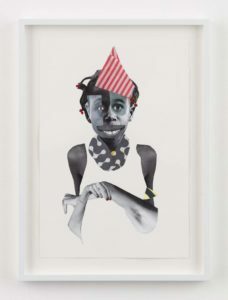 In this same spirit the artist has envisioned his curated show as a reaction to the extreme right-wing politics and xenophobia that has resurged across the globe, and as a display of African Resistance. Understanding art as a talisman, a device that possess transformative energy, that is a vehicle for change, Shonibare has collated a heterogeneous survey of works by African artists, its Diaspora and of other backgrounds but who do not necessarily conform to a western vision of art and are sensitive towards African or Black matters. 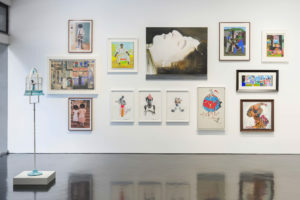 The exhibition is spread over the two locations of Stephen Friedman Gallery, and collates a survey of forty-six participating artists. The British-Ghanaian Larry Achiampong participates with two works from his series ‘Glyph’, it reflects upon the ongoing and relentless processes by which some people are marked as expendable, disposable and ungrievable “others”. 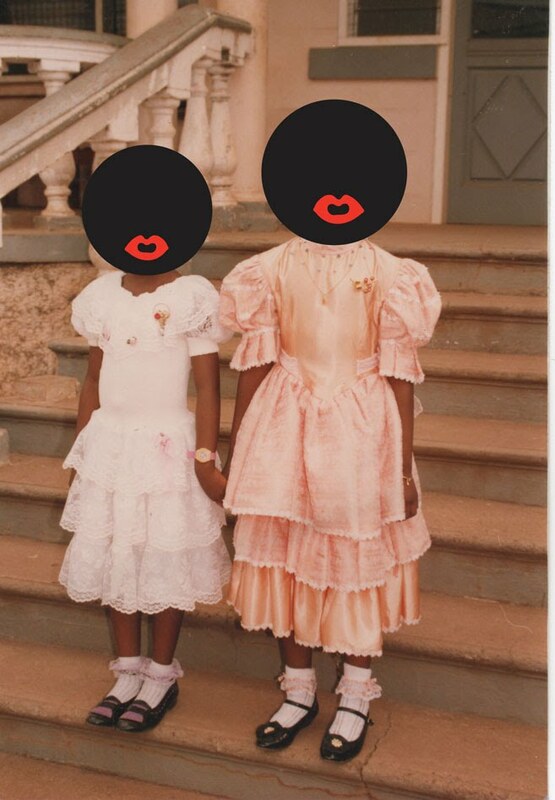 Using portraits from his family’s photo album, Achiampong digitally replaces the individual’s faces with black circles with red lips. The lack other facial features is a disconcerting reminder of how stereotypes dehumanise their subjects, and how Western media tends to misrepresent minority groups as culturally homogenous. 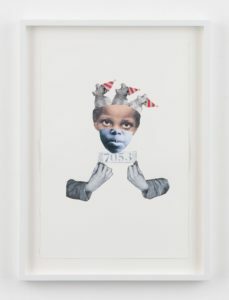 It is an unsettling allusion to the ‘golliwog’, the character represented in Robertson’s marmalade jars, and that he would see as a child during breakfast and other family meals. Achiampong’s work functions as a reminder of the legacies of Empire, colonialism and its more domestic forms of racism. Zina Saro-Wiwa’s Holy Star Boyz alludes to the fantastic representation of a new breed, a hybrid form of existence, made of new material that cannot truly belong. 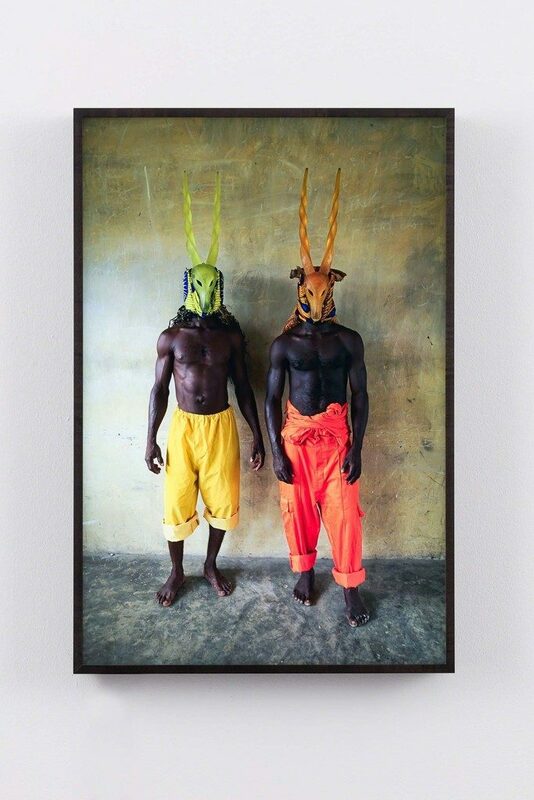 A continuation of the previous series Karikpo, Saro-Wiwa uses antelope-inspired masquerades, unique to the Ogoni people, to explore a survey personal emotions and socio-political matters through the world of masquerade in the Nigel Delta. In this series, the artist looks at how the contemporary industry has impacted and altered Nigerian social performances. 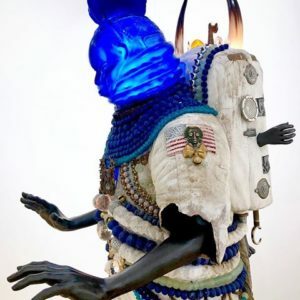 The artist uses petroleum-based resin as opposed to the traditionally used wood, to re-create Karikpo masks, which function as a vehicle for meditating on topics such as alienations, hybridity, education, and diaspora. The colours of the masks reference those worn by industrial labourers and inmates in the Niger Delta and around the world. 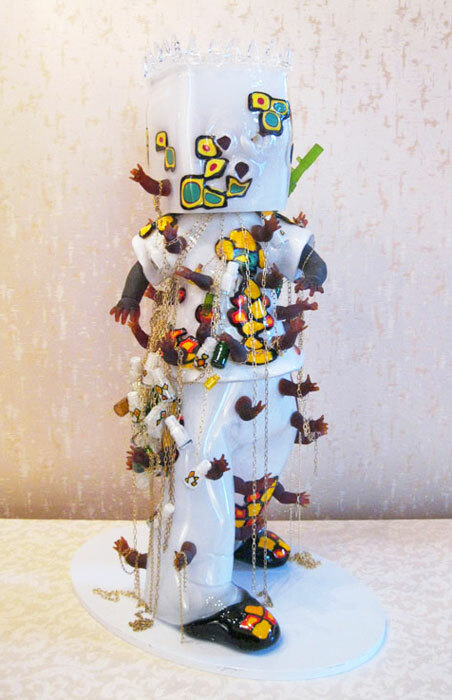 Another work in the exhibition not to be missed is Hew Locke’s Mummy’s Little Soldier. Locke is an eclectic art produces that uses a wide range of media, including in many cases found objects. The piece is made of Murano glass and metal chains. Using an undertone of satire and humour, Mummy’s Little Soldier represents child soldiers, and the fragility of the glass, the vulnerability of those. The British brothers Jack & Dinos Chapman are also part of the show with three of their The Chapman Family Collection: CFC72540310, CFC72337192, & CFC76372567. The inauthenticity of the sculptures doesn’t go unnoticed. Indeed, the artists make continuous references to Ronald McDonald and the fast-food mammoth restaurant throughout the series. 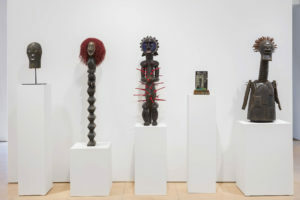 The figures, of appropriated African aesthetics or ‘so-called’ primitive art, happen to enclose a witty critique of Modernism in line with contemporary voracious capitalism. 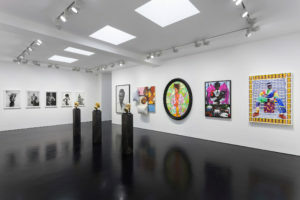 Other artists in the show include Faith Ringgold, Kudzanai-Violet Hwami, Genevieve Gaignard, Marlene Dumas, Wangechi Mutu, Romare Bearden, William Kentridge, Ghada Amer, Whitfield Lovell, Samuel Fosso, Derrick Adams, Kehinde Wiley, Hassan Hajjaj, Isaac Julien, Sonia Boyce, Mickalene Thomas, Zanale Muholi, Zac Ové, Abdoulaye Konaté, Otobong Nkanga, David Hammons, and more. 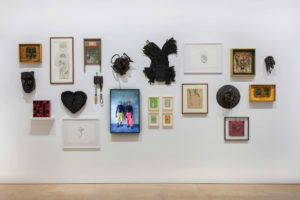 Talisman in the Age of Difference, Curated by Yinka Shonibare. Stephen Friedman Gallery, London. Open until 21 July 2018. Raquel Villar-Pérez is an art curator, art writer, and artist based in London. She is interested in decolonial discourses and aesthetics within art practices from the Global South, mainly from Africa and Latin America, and how they resist the trends set by Globalization. She is very sensitive to women experiences and notions of transnational feminisms, and how contemporary art practices echo them. She tends to work collaboratively to open up participative processes to generate novel inclusive and progressive art narratives. As an artist she has started exploring decoloniality in Western aesthetics, particularly looking at her own family background, and how these can survive in the fringes of the unstoppable neoliberalism established in contemporary societies.